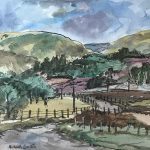 Scottish landscape painter in oils and watercolours. Condie was born in Kirkcaldy and studied art at Edinburgh College of Art, He was the Art Master at Brechin High School from 1928 until his retirement in 1963. 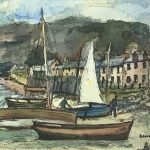 He was elected a member of The Royal Scottish Society of Painters in Watercolours in 1959. Condie exhibited regularly throughout his life, both at the RSW and the Royal Scottish Academy, between 1937 and 1971 rarely missing a year at the RSA, showing 60 works with them over that period. Examples of his work are held in the public collections of Perth & Kinross Council, Dundee Art Gallery and Edinburgh City Council.